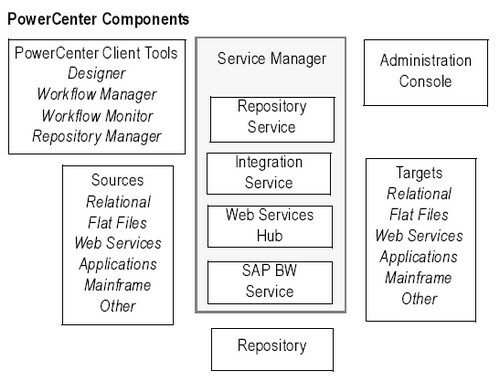 Architecture for 8.x version of Informatica PowerCenter. PowerCenter provides an environment that allows you to load data into a centralized location, such as a data warehouse or operational data store (ODS). You can extract data from multiple sources, transform the data according to business logic you build in the client application, and load the transformed data into file and relational targets. PowerCenter also provides the ability to view and analyze business information and browse and analyze metadata from disparate metadata repositories. The Power Center domain is the primary unit for management and administration within PowerCenter. The PowerCenter - Service Manager runs on a PowerCenter - Domain. The Service Manager supports the domain and the application services. Application services represent server-based functionality and include the Repository Service, Integration Service, Web Services Hub, and SAP BW Service. The PowerCenter repository resides in a relational database. The repository database tables contain the instructions required to extract, transform, and load data. The Administration Console is a web-based administration tool you can use to administer the PowerCenter domain. The PowerCenter Client is used to manage users, define sources and targets, build mapping and mapplets with the transformation logic, and create workflows to run the mapping logic. The PowerCenter Client connects to the repository through the Repository Service to modify repository metadata. It connects to the integration service to start a workflow. PowerCenter - Repository Service (Process). The Repository Service accepts requests from the PowerCenter Client to create and modify repository metadata and accepts requests from the Integration Service for metadata when a workflow runs. The Integration Service extracts data from sources and loads data to targets. PowerCenter - Web Services Hub. Web Services Hub is a gateway that exposes PowerCenter functionality to external clients through web services. Powercenter - Sap BW service. The SAP BW Service extracts data from and loads data to SAP BW. Data Analyzer provides a framework to perform business analytics on corporate data. With Data Analyzer, you can extract, filter, format, and analyze corporate information from data stored in a data warehouse, operational data store, or other data storage models. Metadata Manager is a metadata management tool that you can use to browse and analyze metadata from disparate metadata repositories. Metadata Manager helps you understand and manage how information and processes are derived, the fundamental relationships between them, and how they are used. PowerCenter Repository Reports are a set of prepackaged Data Analyzer reports and dashboards to help you analyze and manage PowerCenter metadata.